Its a beautiful Wednesday morning here in small town Nebraska! As I sit and sip on my coffee and reflect on this past weekend I have had, more to come about that later, all I can think about it this beautiful invention called the Pizookie. Now I know some of you may know what this is, but most might not. This little word Pah-zoo-key is a beautiful mix of half baked cookie with cold ice cream melting on top…. like I said above Ah-ha-mazing! So instead of racing to the grocery store to get this little evil dessert, I will write about it in hopes it will take my bad cravings away, lol…. a girl can always wish! – go home, lol, and pre heat your oven to the temp on the cookie package. – promptly top with a scoop of your ice cream and enjoy!!!! So here was my try to take away a craving by sharing it with all of you guys! 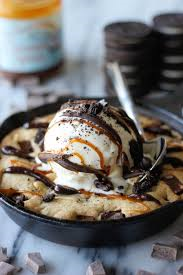 Let me know what you think or if you have had pizookies before, comment on your favorite combination. Is it chocolate chip and vanilla ice cream, oatmeal and mint chocolate chip, double chocolate cookie and chocolate ice cream!?!?!?!? We love these too!! We make the white chocolate macadamia pizookie!!! Mine doesn’t look like that picture but they still taste Ah-ha-mazing! !